Penns Creek Raceway Park and/or raceway officials reserve the right to reject any kart, driver, or race team without cause or recourse. Vehicles including towing equipment, trailers, racing equipment, and all other equipment located in the pit area or restricted area are NOT covered by insurance. Every person who enters into the pit area and racing area, or participates in competition sanctioned or promoted by Penns Creek Raceway Park does acknowledge, represent and warrant that he or she has read, understands and agrees to abide by the rules in their entirety. Application or permission to participate or enter the grounds shall constitute acceptance of the same. Each person that enters into the pit and racing area must purchase a pit pass and sign the track release form in order to be eligible for track insurance benefits. Payment for pit pass is required at each race and must be displayed at all times in the pit and racing area. 1. No one is permitted in the pit area without purchasing a pit pass. The purchase of a pit pass assures your signature for verification of insurance protection. Do not lose your wristband! You will need it in the case of a rainout. Wristbands should be visible at ALL TIMES while in the pit area. 2. All persons, age 15 & under, must be accompanied by a parent or legal guardian over age 21, and have a waiver release form signed by that adult. 3. Anyone injured while at the track must report the injury immediately to a track official regardless of the severity. 4. ABSOLUTLEY NO ALCOHOLIC BEVERAGES permitted before or during the event. No one under 21 will be in possession of or consume alcohol or drugs at any time. Violators will be ejected from the premises immediately! 5. VERBAL or PHYSICAL ABUSE: All drivers and crew/family members will conduct themselves in an orderly manner. Physical violence, verbal abuse, or threats directed at any individual; official, participant, spectator, etc., will subject offender to immediate disqualification for the days event, immediate ejection, possible suspension from the premises, and legal prosecution. 6. Drivers are responsible for their crew/family member’s actions. Unacceptable actions of crew/family members may subject driver to disqualification from the event or suspension from the premises. 7. No driver will be added to a class after the completion of a heat race. 8. Reserved parking spots are good for all point races. 9. Anyone requesting a change in classes (i.e. moving from a junior division to a senior division) will be entirely at the discretion of the track officials. Points cannot be carried from one class to another. A driver can “move up” to another class for a maximum of 6 races without losing points in original class. Once a driver has clinched a points position in a class, that driver can “move up” to another class for the remainder of the season. 1. NO DRIVING IN PITS: Engines must be shut off at or adjacent to the scales. 2. UNSPORTSMANLIKE DRIVING: If in the judgment of the presiding officials, a participant is bumping, crowding, chopping, blocking, or pushing other participants in other than an inadvertent manner, that participant shall be subject to immediate disqualification from the event and possible suspension from the premises. This rule applies before, during, and after the event. 3. A rolled black flag is a warning signal. An open black flag signals disqualification. 4. Heat race line-ups will be determined by drawing a number. Features will be the order in which you finished the heat event, unless announced otherwise by race officials prior to the start of that day’s event. 5. Heat races will consist of 10 laps. Features will consist of 15 laps (unless otherwise noted). Consolations will be 8 laps. Any class with only 1 kart entered will be reduced to a 5 lap heat and 10 lap feature. Track officials reserve the right to reduce or increase laps prior to start of race, or due to an inclement weather threat. 6A. If your kart experiences a problem at the grid prior to the official start, driver will be given 3 pace laps to get on the track. After the 2nd pace lap, driver must start in the rear. The kart will be removed from the event if unsuccessful after the 3rd pace lap. 6B. If a kart drops out of a race prior to the first completed lap, all karts starting in the row that kart was scheduled for will slide forward. (No Crossovers). If a kart scratches prior to the class leaving the grid, karts will “crossover” for the initial start. 7. Official starts will be double file. The front row karts are expected to be side by side and will not accelerate until the green flag is dropped. Jumping will result in a warning for the first offense. The second offense will result in the kart charged with jumping sliding back one row and the kart directly behind sliding forward one row. The third offense will result in disqualification. 8. If, for any reason, the third attempt fails, the start will be single file. 9. All restarts after the first completed lap will be single file. Karts will pass to the outside of the cone on restarts. If a kart passes another kart before passing the cone, or any kart that hits the cone will be penalized two spots on the next restart or at the end of the race. 10. If, for any reason, a kart loses power or needs to exit the track, the driver is responsible to raise his/her hand in the air to warn other drivers, and steer the kart to the infield safely away from the racing surface or to the exit. 11. 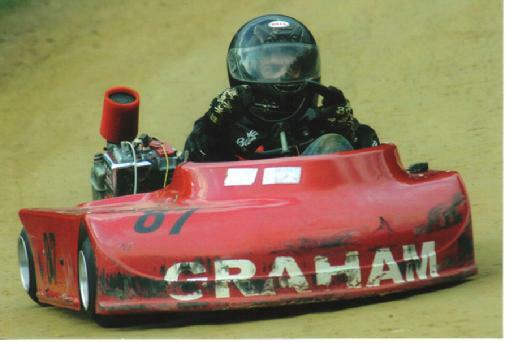 ONCE A KART LEAVES THE TRACK, IT CANNOT RETURN TO THE RACE. 12. In the event of a caution (yellow flag), karts will immediately slow. NO RACING BACK TO THE FLAG! Any kart violating this rule will be placed at the rear of the field or possibly face disqualification. 13. Any kart that spins out on purpose (at the discretion of the flagmen) will be disqualified from that race. 14. Any kart that spins three times within one race (contact from another kart does not count) will be disqualified from that race. Kid Kart & Rookie classes- 4 spins. 15. Any kart that loses power on the track during a caution may rejoin the field in the position they were last scored, provided they are under power when the race is ready to resume. If the kart is not under power within the two pace laps, it must forfeit the race. 16. In the event of a race stoppage (red flag), karts will immediately stop. Race officials will direct drivers when to move. NO CREW MEMBERS PERMITTED ON THE TRACK UNTIL DIRECTED BY A RACE OFFICIAL! Maximum 2 crew members per kart. 17. Restart order will be as follows; any karts on the lead lap that have passed the start/finish line prior to the caution or stoppage will be placed in the order they were scored. All karts that have not passed the start/finish line prior to the caution or stoppage will be placed in the order they were scored on the previous lap. Lapped karts will restart in the rear. 18. Any karts on the verge of being lapped (blue flag will be displayed) will stay in their line, giving the lead lap karts the choice of passing on the inside or outside. 19. ABSOLUTELY NO ADJUSTMENTS MAY BE MADE TO A KART, TIRES, AIR, ECT. AFTER THE START OF A RACE. If a kart has a minor problem (such as a chain coming off, loose body kit piece, etc. ), repair may be made at the discretion of the head flagman, but NO TOOLS ALLOWED. 20. After the white flag is waived signaling one lap to go, there will be no one lap shootout. If an incident occurs after the white is waived, and the leader has crossed the start/finish line, the checkered and caution (or red) flags will be waived simultaneously. DO NOT RACE BACK TO THE FLAG! All drivers still under power MUST cross the finish line under the caution/checkered to be scored. The finish order will be the order of the last completed lap for all karts that have not crossed the start/finish line before the caution, with karts involved in the incident being scored in the back of the order. 21. All competitors must stop for weight check after heats and features. Failure to do so will result in disqualification and loss of points for the event. 22. NO DRIVER, CREW/FAMILY MEMBER, OR SPECTATOR WILL APPROACH THE FLAGSTAND DURING A RACE FOR ANY REASON OTHER THAN A SAFETY ISSUE (i.e. missing neck brace, gloves, something loose on a kart, etc.) This will result in immediate disqualification of represented driver. 23. Any active feature race stopped for weather will be scored as official after the halfway point. Drivers will be awarded the position they were last scored prior to race stoppage. If the race has not reached halfway, it will be made up at a date to be announced (the next week in most cases) with a complete restart. All other classes will be scored in the heat race finish order. 24. Spectators, crew members, family members, must stay in designated observation areas during all warm ups, heat races, and feature races. Failure to follow this rule will result in the driver being disqualified. 25. The Head Flagman’s decisions are final. 26. Finally, BE SAFE, DRIVE CLEAN, HAVE FUN!!!!!!!!!! B. Yellow: Caution, Slow down immediately! DO NOT PASS! D. Blue: You are about to be lapped. Hold your line and allow lead lap karts to pass. F. White: One lap to go. G. Checkered: Race is complete. 1. All karts are subject to safety inspection by officials at any time. 2. All numbers must be large, legible, and on all four sides of kart. 3. If you change a kart or engine after it has been qualified, you will automatically start at the rear of the field. 4. The racetrack has the right to tech (tear down) at any time. If your kart is found illegal after tech, you will be disqualified from that day’s event and not receive any points. 5. All weights must be bolted and cotter pinned or double nutted. We also strongly recommend painting all weights white. 6. No tools may be used on a kart after the official start of the race. 7. All WKA tech rules apply. All AKRA tech rules apply to Clone divisions (See amendments on Clone Rules Page). 8. Mufflers are mandatory for all regular classes (except Controlled Caged). 10. All tire sidewalls must remain as supplied from the factory. Except for inside prep, no adding of material to inside of tire to manipulate the flex of the sidewall. All protests must be presented to the Tech Official or Race Director within 2 minutes of the completion of the race event. At this time, the protestor and protestee’s karts will be required to park at the specified tech area for inspection. The protestor will be teched first. 1. If protestor is illegal and protestee is legal-protestee will receive 50% and the track will receive 50%. 2. If protestor and protestee are both illegal, the 100% of the fee will go to the track. 3. If the protestor is legal and protestee is illegal, protestor will receive 50% and the track will receive 50%. 4. If the protestor and protestee are both legal, the protestee will receive 50% and the track will receive 50%. 1. COMPLETE- The protestor must pay $100 cash up front which will be held by track officials until final decision is made. All parties involved will be teched by WKA rules (AKRA rules for Clones). Any refusal of tech will automatically result in disqualification and loss of points for that event. held by track officials until final decision is made. This tech will involve checking fuel, oil, and the restrictor (if applicable). motor sports use are mandatory. See WKA Rulebook for specifications. Helmet must be in good condition and is subject to pre race technical inspection. Helmet must be secured with a strap. 2. Face Shield: Full face shield is integral with helmet is required. 3. Neck Brace: All drivers must wear an unaltered collar-type neck brace designed for motor sports. 4. Driver Clothing: Drivers are required to wear a heavy, long sleeve jacket and ankle length trousers, or an approved racing suit. All drivers must wear gloves, and footwear must provide ankle support. 1. Drivers must race a minimum of half the point races to be eligible for seasons end points awards. 2. Drivers must be present at banquet to receive awards.